Thailand welcomes you with a smile and keeps you there with everything else. Maybe it’s an island paradise where you’ve found love. Maybe it’s that delicious meal that you just can’t get enough of. Maybe it’s the sense of wonder at an ancient ruin or the calm of a Buddhist temple. Maybe it’s just that cheap room you don’t want to leave because it seems like such a bargain. My time in Thailand was mostly spent on the mainland and focussed on Bangkok, Ayutthaya, Sukhothai, and Chiang Mai with an altogether too-fast trip to one of the country’s islands. The photos here go from the bustling backpacker mecca of Bangkok’s Khao San Road and get a lot more peaceful from there. Along the way, that world-famous Thai smile will keep you company and keep you feeling welcome. 01. 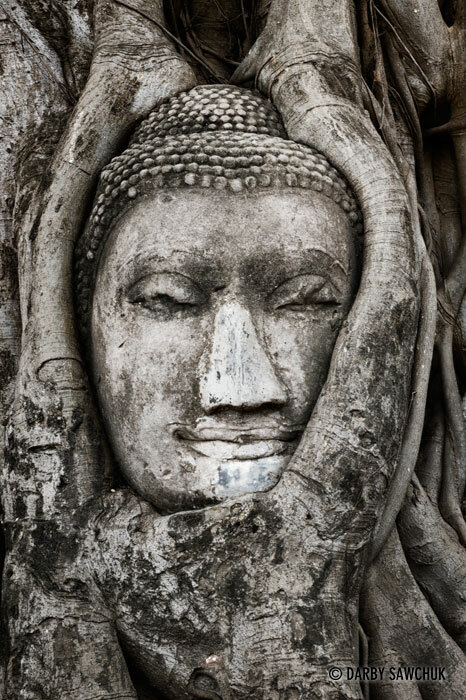 A bodhi tree grows around the head of a Buddha statue in Wat Mahathat in Ayutthaya, Thailand. 02. 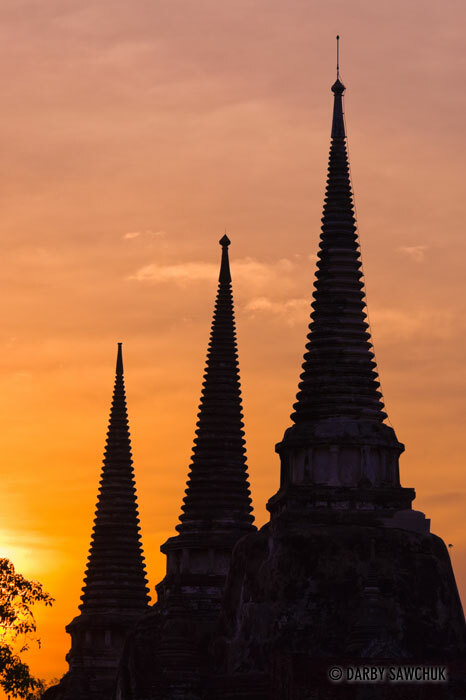 The sun sets on Wat Chaiwatthanaram, an ancient Buddhist temple in Ayutthaya, Thailand. 03. 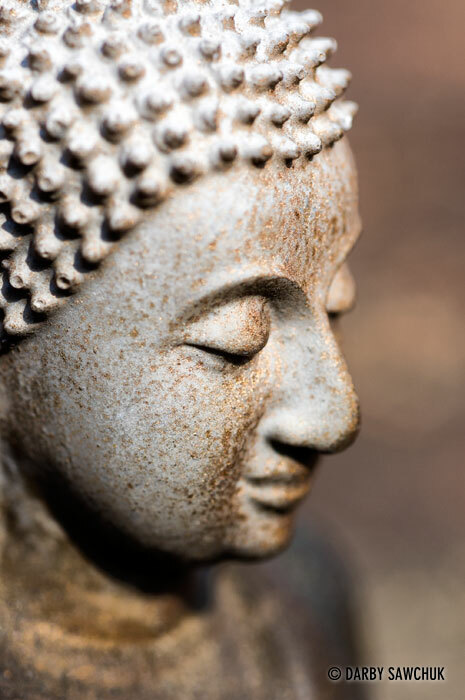 A close-up of a Buddha icon in Ayutthaya Thailand. 04. 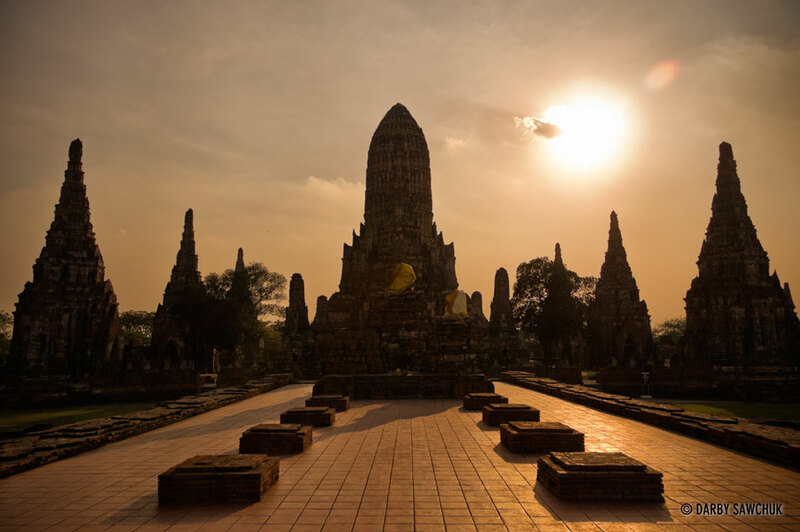 The ruins of Wat Phra Si Sanphet in Ayutthaya, Thailand at sunset. 05. 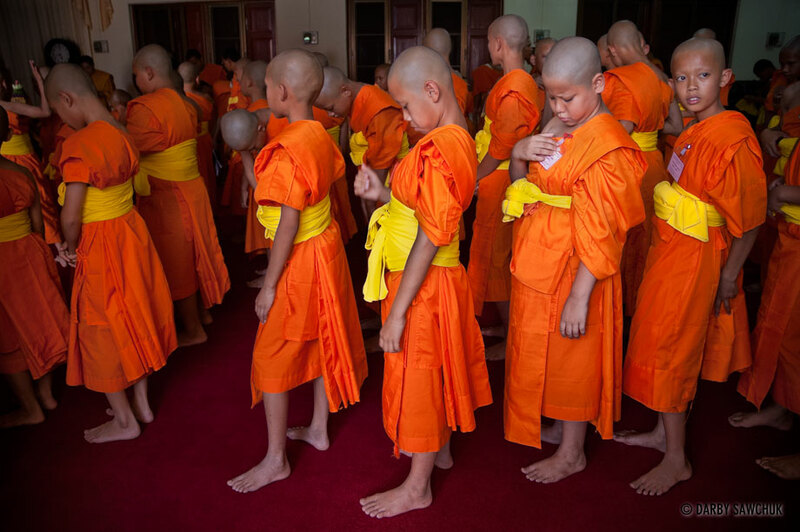 Young boys wear white robes and kneel during their ordination to become novice Buddhist monks at Wat Chedi Luang in Chiang Mai, Thailand. 06. 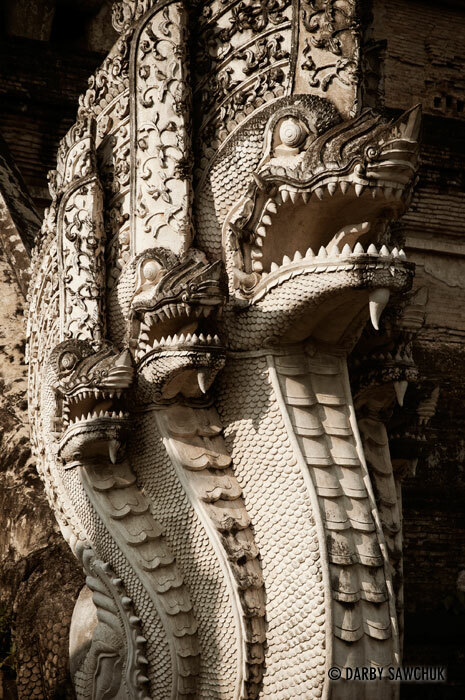 A five-headed naga snake at Wat Chedi Luang in Chiang Mai, Thailand. 07. Monks admire a golden chedi at Wat Doi Suthep near Chiang Mai, Thailand. 08. 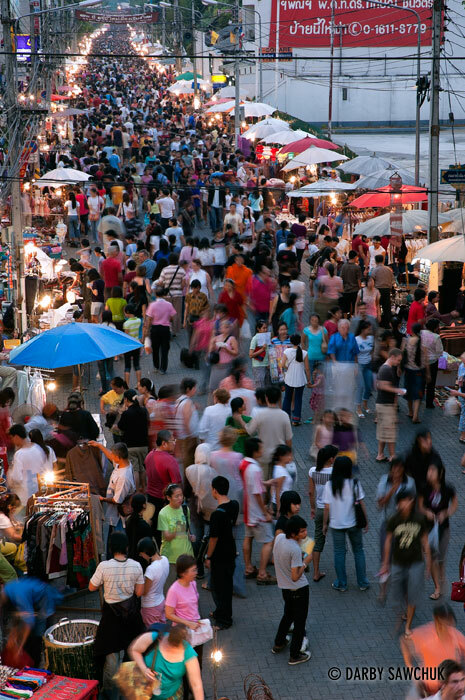 Customers flood the busy night market in Chiang Mai, Thailand. 09. 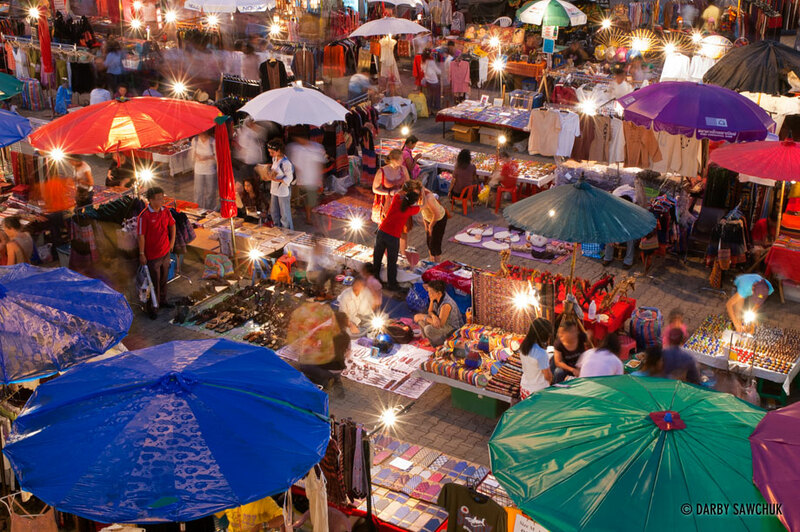 Customers wander through the crafts on sale at the night market in Chiang Mai, Thailand. 10. 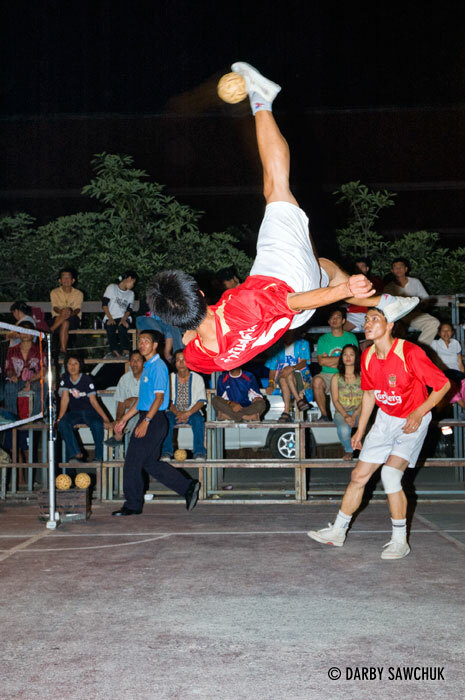 A game of Sepak Takraw in Chiang Mai, Thailand. 11. 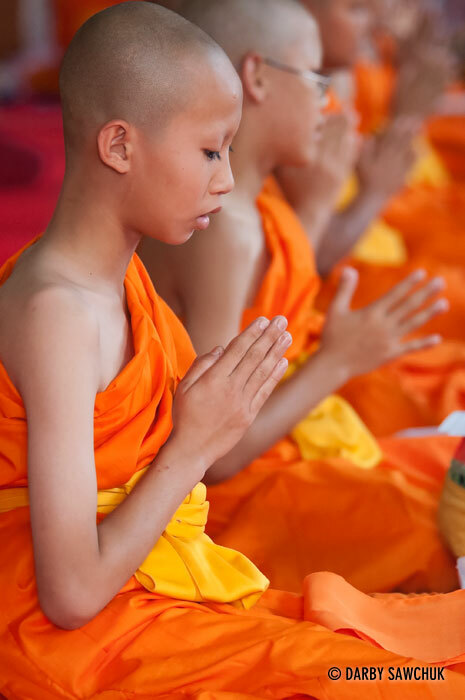 Novice Buddhist monks pray at their ordination at Wat Chedi Luang in Chiang Mai, Thailand. 12. 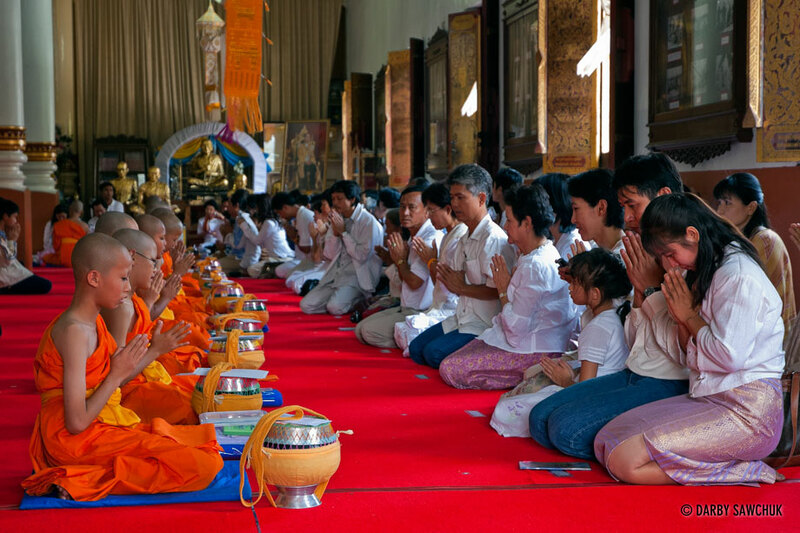 Novice Buddhist monks pray with their families at their ordination at Wat Chedi Luang in Chiang Mai, Thailand. 13. The shaved heads of newly-ordinated Buddhist monks in Chiang Mai Thailand. 14. 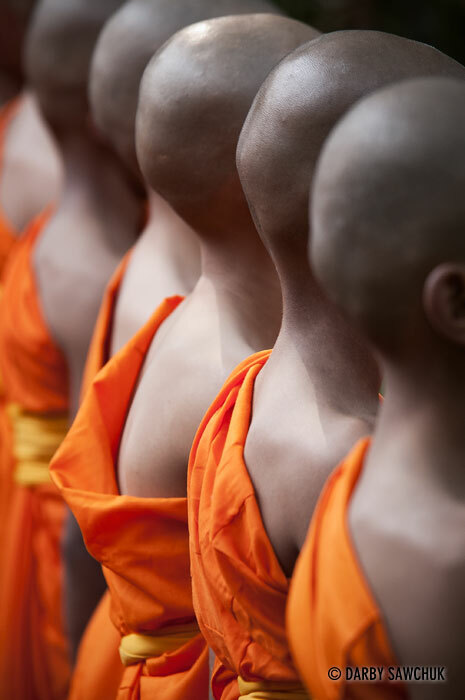 Novice Buddhist monks line up for their ordination ceremony at Wat Chedi Luang in Chiang Mai, Thailand. 15. 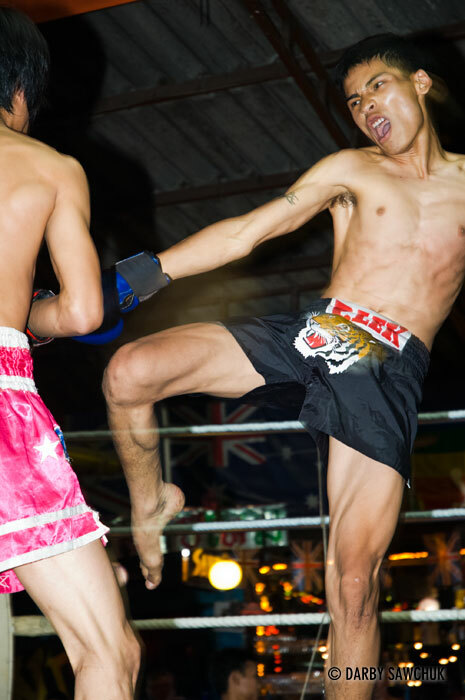 A muay thai fighter delivers a kick in the Thai kickboxing combat sport in Chiang Mai, Thailand. 16. 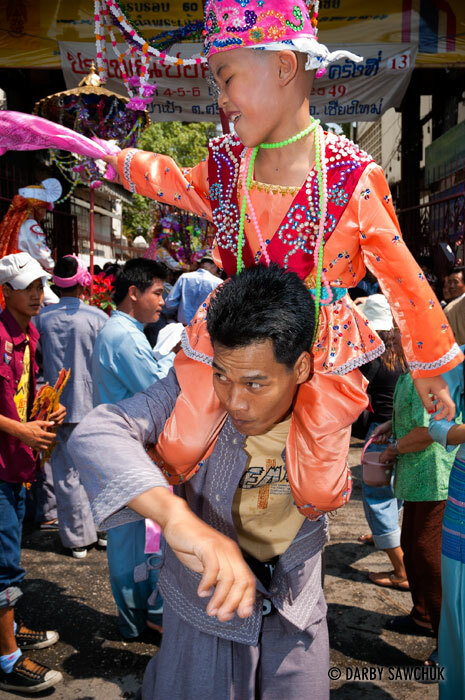 A young boy’s relative carries the novice monk at Wat Pa Pao during the Poi Sang Long festival in Chiang Mai, Thailand. 17. 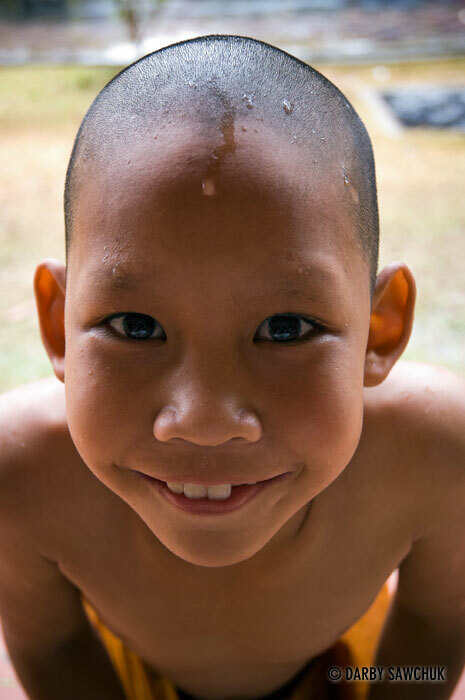 A young novice monk smiles after playing in the rain in Chiang Mai Thailand. 18. 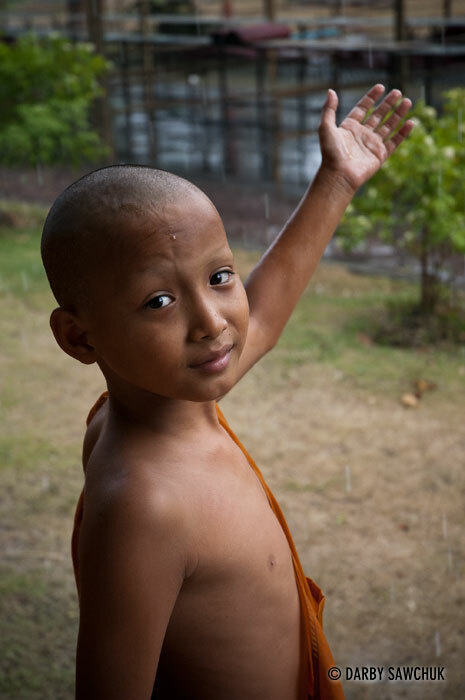 A young novice monk touches the rain in Chiang Mai Thailand. 19. 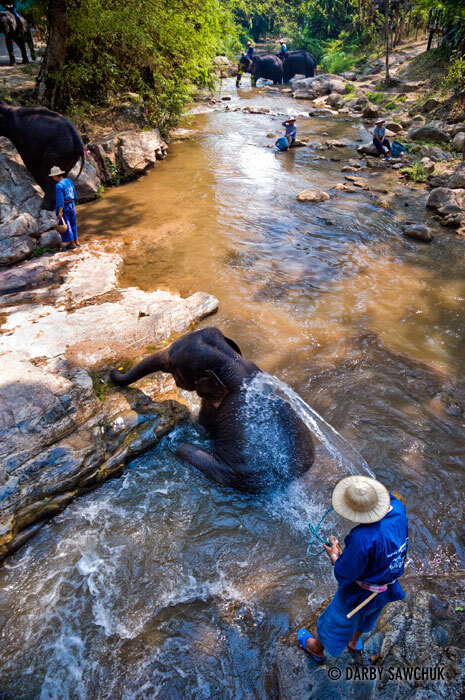 Elephants get a bath in the river at the Elephant Training Center in Mae Sa, Thailand. 20. 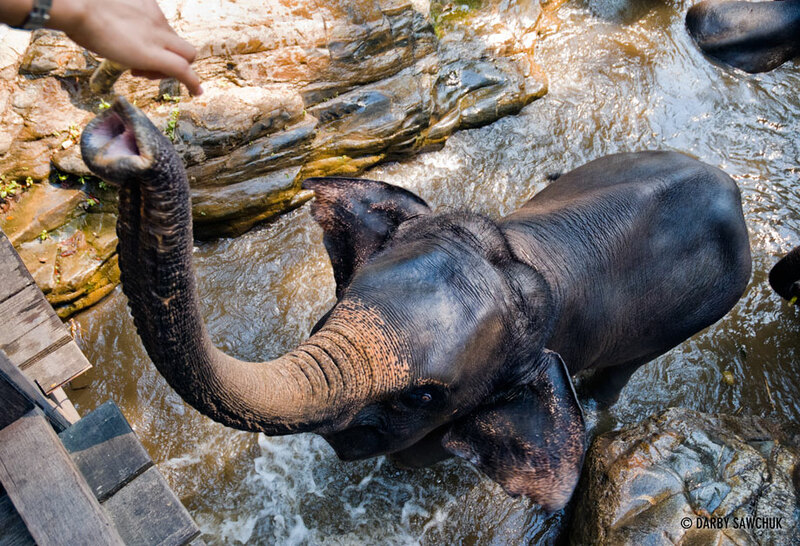 An elephant reaches up with its trunk at the Elephant Training Center in Mae Sa, Thailand. 21. 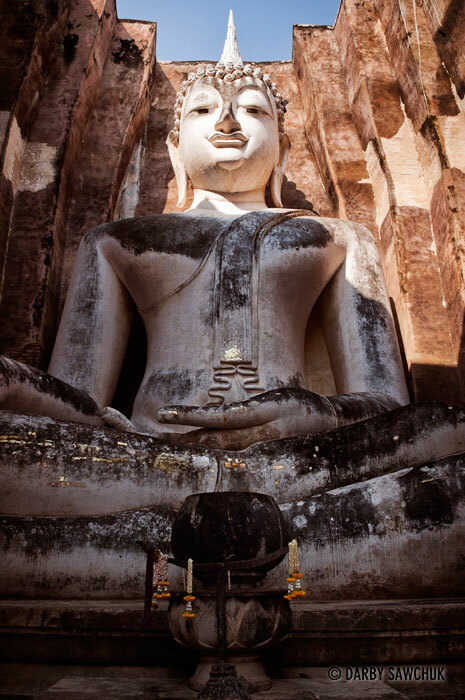 A Buddha statue at Wat Sa Sri in the Sukhothai Historic Park in Thailand. 22. 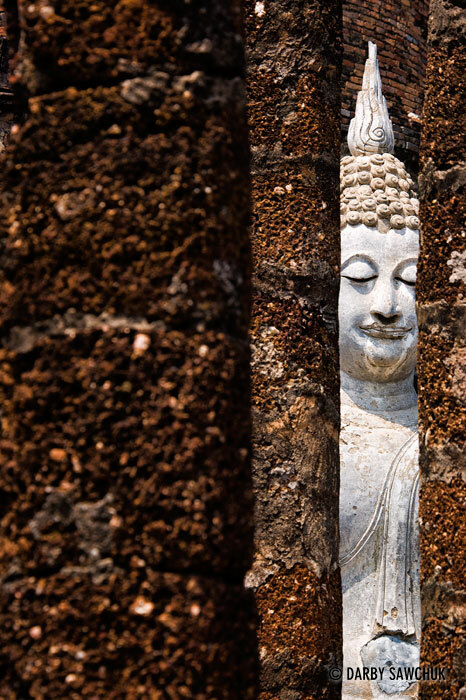 A Buddha statue viewed between ruined pillars at Wat Sa Sri in the Sukhothai Historic Park in Thailand. 23. 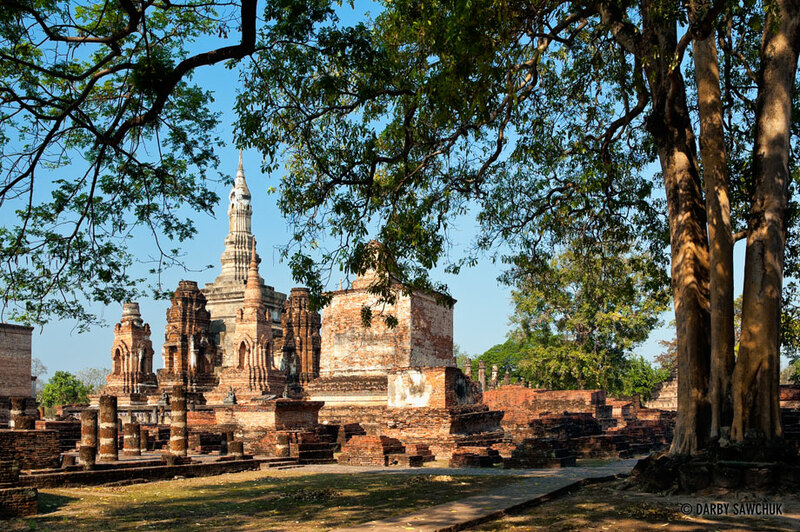 Wat Mahathat in the Sukhothai Historic Park in Thailand. 24. 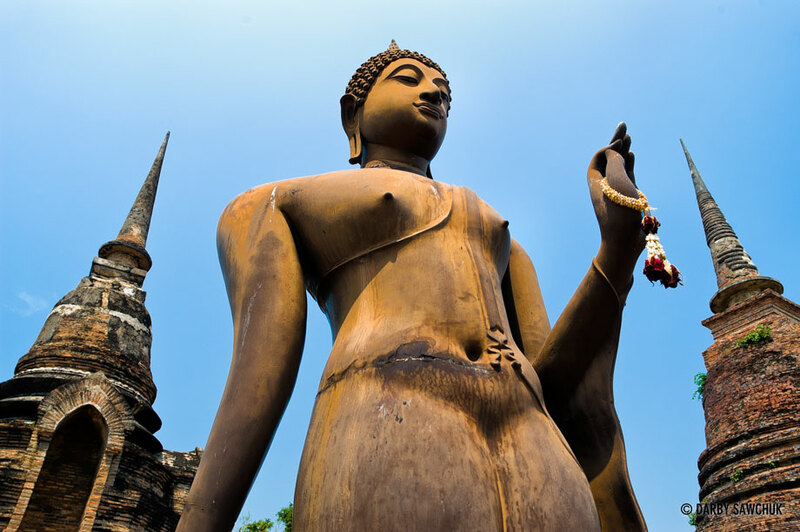 A giant Buddha statue, Phra Achana at Wat Si Chum in the Sukhothai Historic Park in Thailand. 25. 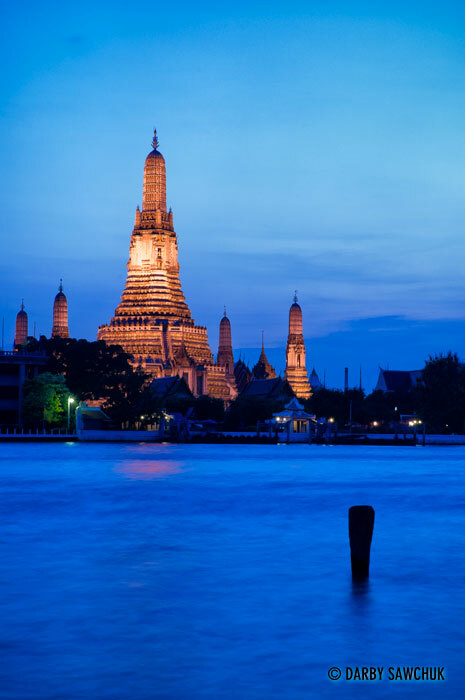 Wat Arun, the Temple of the Dawn, on the West Bank of the Chao Phraya River in Bangkok, Thailand. 26. 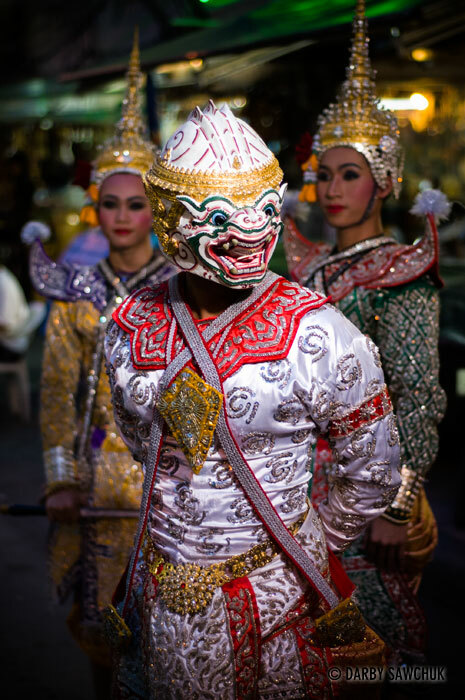 Costumed Thai dancers performing a Khon dance on Khao San Road in Bangkok, Thailand. 27. 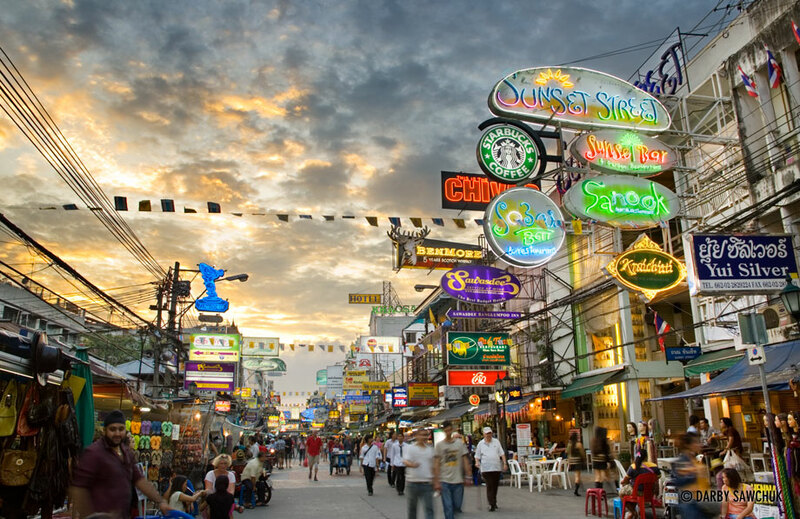 The sun sets over Khao San Road, a popular backpacker neighborhood in Bangkok, Thailand. 28. 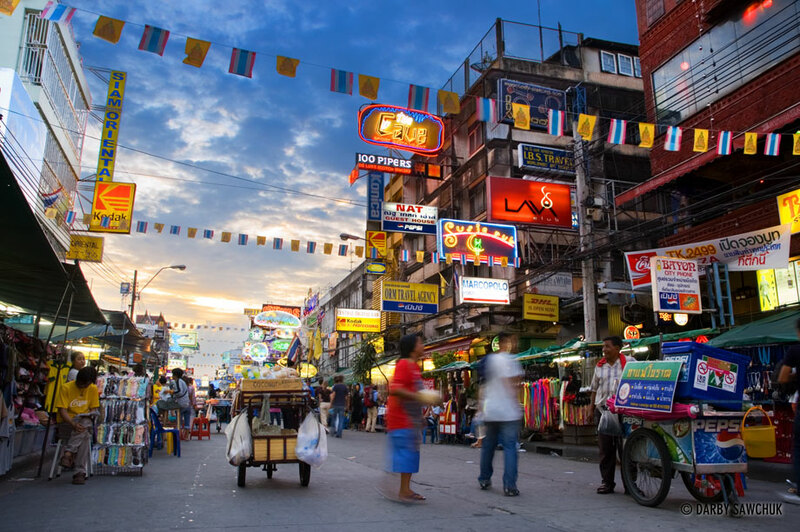 The sun sets over Khao San Road, a popular backpacker neighborhood in Bangkok, Thailand. 29. 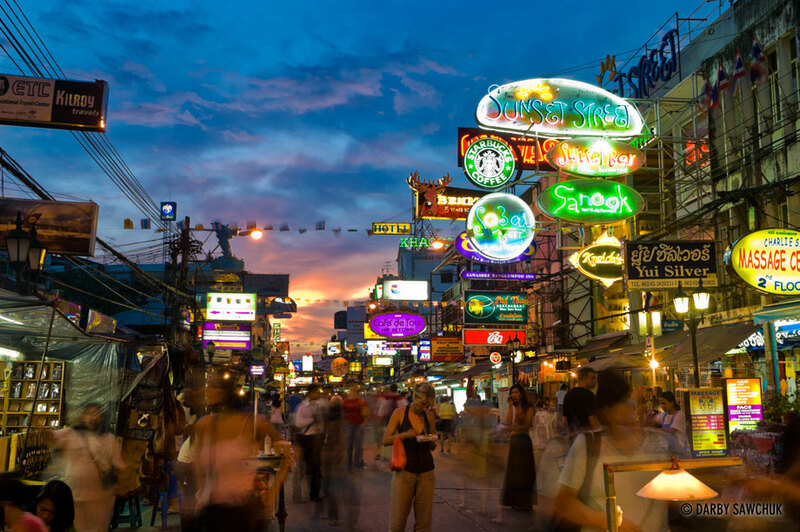 Khao San Road at dusk, a popular backpacker neighborhood in Bangkok, Thailand. 30. 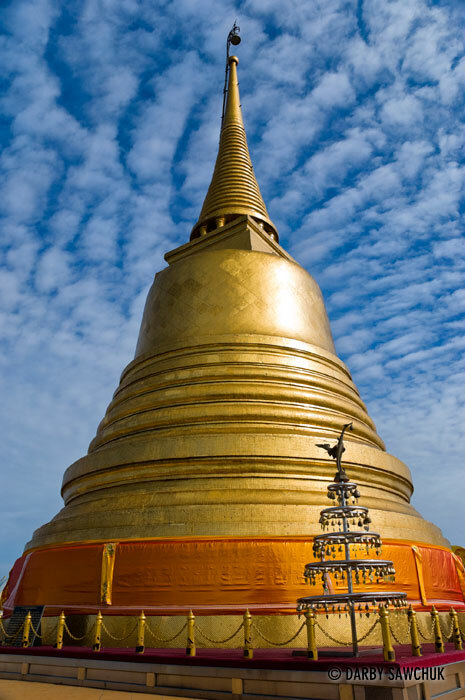 The large chedi on the top of the Golden Mount at Wat Saket in Bangkok, Thailand. 31. 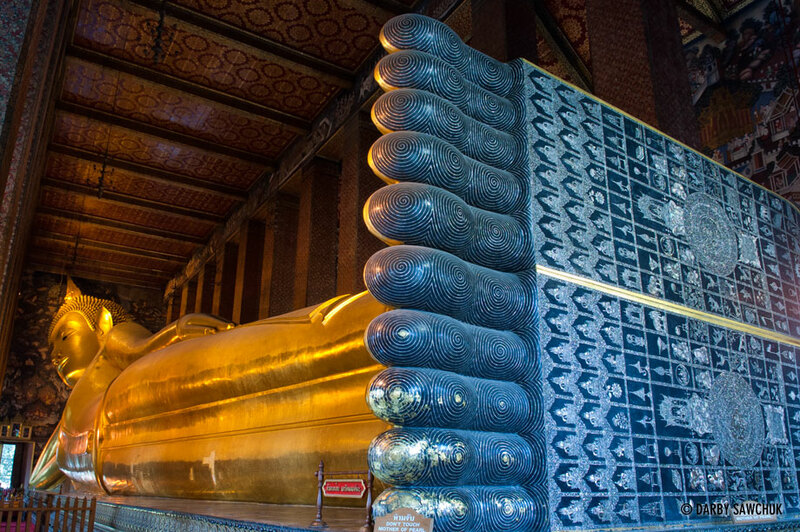 The giant reclining Buddha statue inside Wat Pho in Bangkok, Thailand. The feet are inlaid with mother of pearl patterns and symbols. 32. 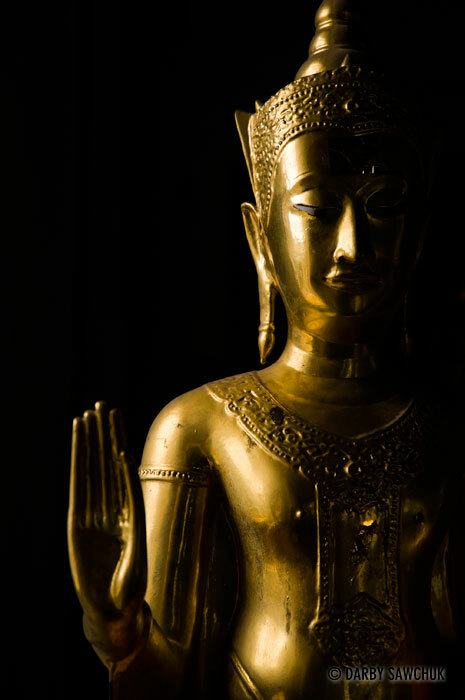 A Buddha statue making the gesture Abhaya mudra meaning fearlessness and symbolising protection, peace, and the dispelling of fear. 33. 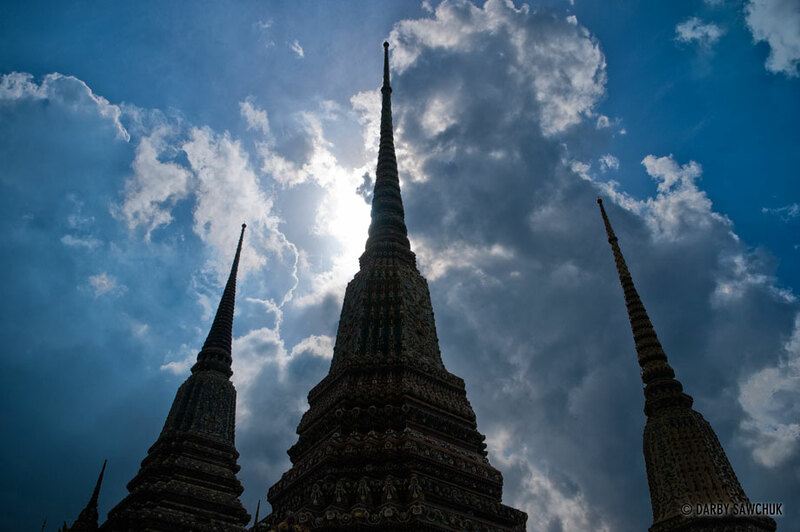 Some of the 91 Chedis inside the grounds of Wat Pho in Bangkok, Thailand. 34. 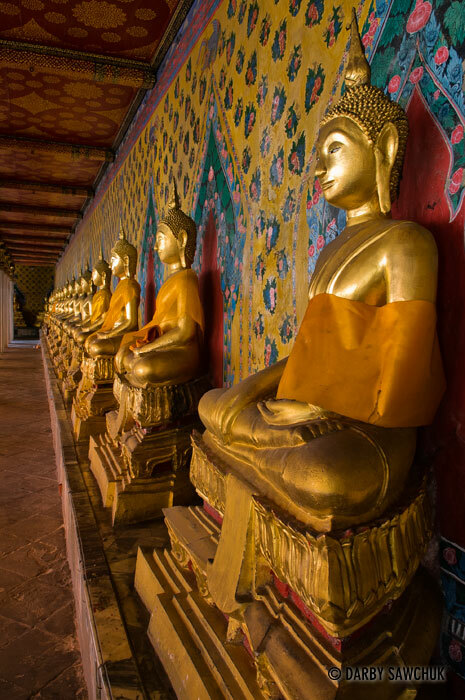 A line of Buddha images inside Wat Arun in Bangkok, Thailand. 35. 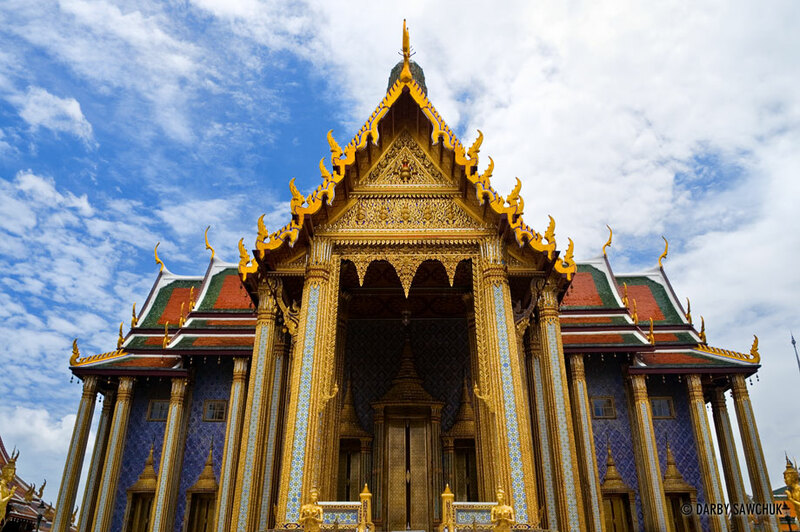 The Temple of the Emerald Buddha at Wat Phra Kaew in Bangkok Thailand. 36. 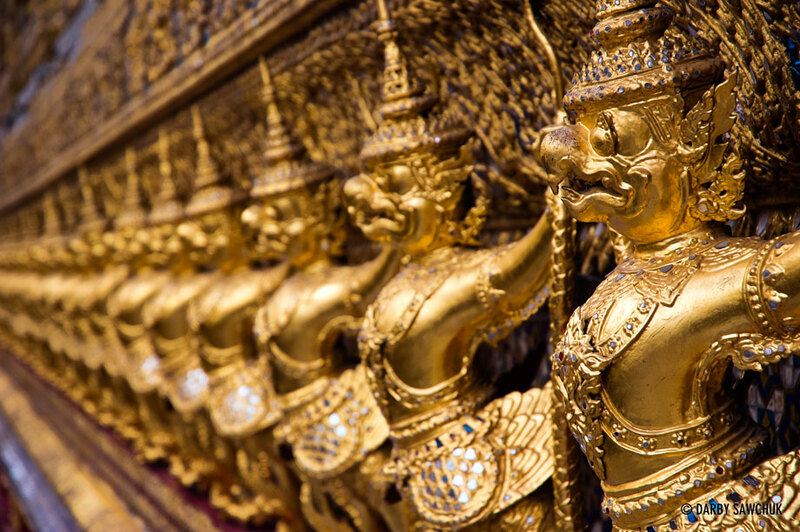 Garuda statues ornamenting the exterior of the Temple of the Emerald Buddha at Wat Phra Kew in Bangkok, Thailand. 37. 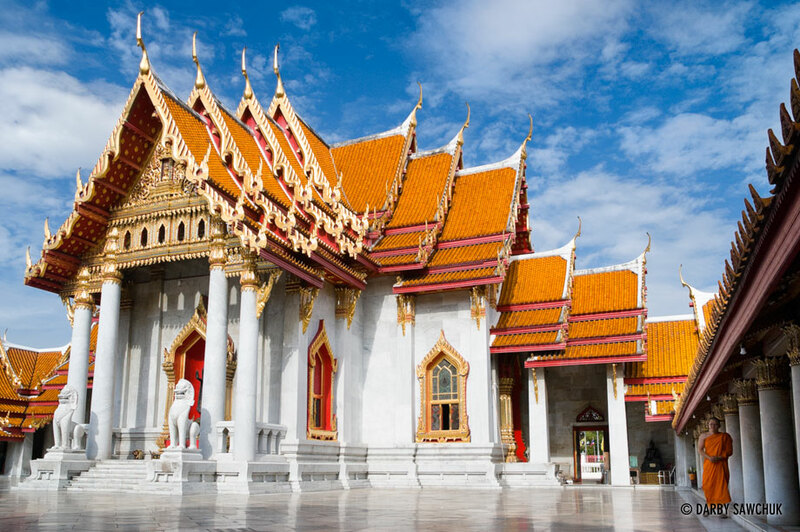 A monk walking near the ordination hall of Wat Benchamabophit, the Marble Temple located in Bangkok, Thailand. Keywords: photos of thailand, images of thailand, pictures of thailand, landscape photography, people photography, travel photography, architectural photography, fine art prints, stock photography. Really great photos that warmed me up.